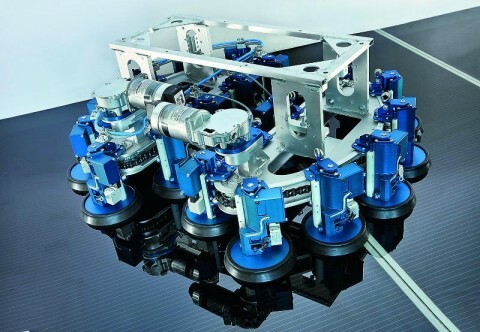 Serbot AG, a Swiss robotics firm is designing what looks like a Scooba robot with legs for cleaning large solar panels. To accomplish this goal, they used parts manufactured by Festo. 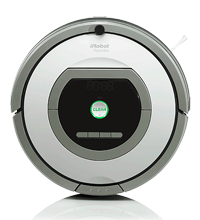 I don’t usually get into large pictures on this site, but this thing is really cool looking, and it’s rare to find such a cool looking thing that is also a cleaning robot. I’ve never thought about this, but apparently keeping large solar panels clean is a real pain and can be dangerous. They get covered with leaves, dust, pollen, pollution, and everything else that falls on them. Solar farms often have to clean them at night, and I guess it’s not as simple as turning a hose on them. The photovoltaic panels are delicate, slippery, and usually tilted at an angle. As more and more solar farms are built with more and more solar panels, cleaning them is going to be a real issue. This sounds like a great place to apply some robot elbow-grease. You just build (or buy) an army of these little suction-cup footed robots and equip them with brushes, wipers, and maybe a spray bottle and a vacuum hose? 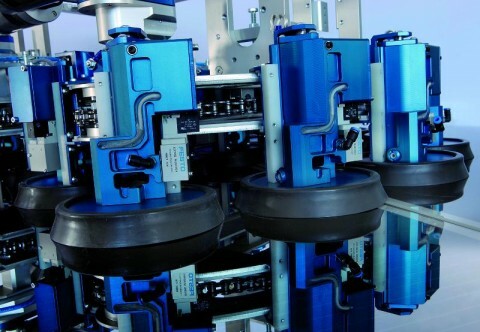 The cleaning robots are made with twenty suction-cup feet on two kidney-shaped carrier frames. As you can see from the photos, the carrier frames are chain tracks, which are attached by a bridge. I would guess that’s where you connect the cleaning devices. To move, the robot rotates the feet around the carrier frames. It looks to me like the feet in the center of the device are the ones that will be engaged with the surface it is cleaning. The robot is designed to know that it has reached the end of a solar panel by feel. Basically, if it can’t get a grip, it withdraws. While this sounds like a cool idea, I wonder why they can’t use something more sophisticated? They solved the problem of how to keep suction by making sure the robot is always moving. The feet which are in contact with the surface at any given time only keep suction for two seconds. This makes it so the robots can travel without using so much energy to hang on.